2010 Capital Criterium – July 11, 2010 – Amazing! Photo by Marco Quezada. What an experience of racing this weekend! I received call-ups both days for being in the Top 10 overall for the USA Crits series! 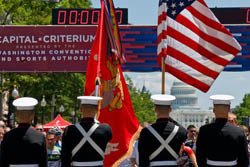 This picture above is right before the start of Sunday’s Capital Criterium during the singing of the Italian National Anthem followed shortly by the American National Anthem. The reason for the Italian anthem is because this race was held in part to promote the start of the 2012 Giro d’Italia in Washington, DC. The course was fun and fast. I worked hard to stay at the front for the entire race and ended up 18th. Saturday night was a fast, fun Twilight Criterium in West Chester, PA. The story of the night for me (besides getting a call-up!) was how much time could I spend in the pits! Only a few laps into the race, I got caught up in a crash on the hill coming out of Turn 3. I think my bike was OK, but later in the race I ended up cracking my derailleur cage when the chain came off. 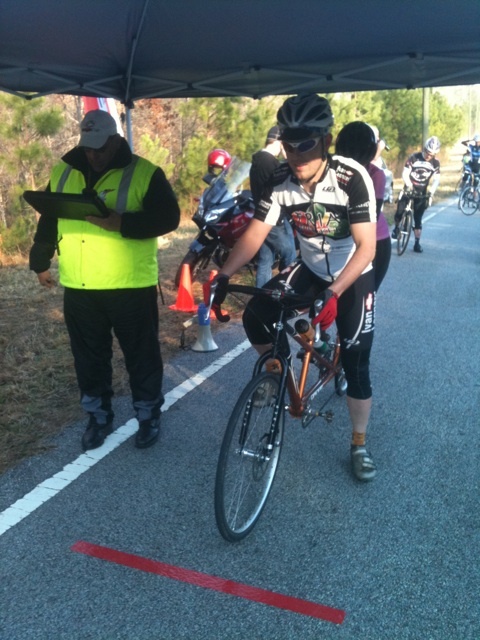 I ran back to the pits and got a SRAM neutral bike, which I was able to use to finish the race (38th place). SRAM was awesome and let me use the bike again the next day since it was impossible to fix the bike without ordering the part. After the weekend’s races, I moved into 6th overall. And even though I’m missing the next race, I’m hoping to still have enough points to be in the Top 10 for Charlotte and Dallas which are the final two races in the series. The weekend was the first time I have flown to a race since 1998. It went pretty smoothly, albeit expensive! Saturday, 11AM Dreary morning here in Baltimore – forecast is for rain tonight in West Chester, PA, too. That means tonight’s Ironhill Twilight criterium is looking to be pretty much a repeat of this year’s Athens Twilight. With one exception, though, I should be getting a call-up which means I won’t be stuck at the back of a huge field! I flew in last night to the Baltimore airport, grabbed a shuttle to the hotel with my giant bike carrier (61 lbs w/ bike, clothes, tools), and then assembled my roughed up bike. Everything inside the bike carrier had come unscrewed and with the handlebars dismounted I forgot to screw the headset together so the fork had almost pulled completely out of the bike – I’m very lucky it didn’t crack! I had been planning to take the free shuttle back to the airport to take a free shuttle to the rental car place to pick up my rental car. But then I realized – wait a minute – I have a bike! So I avoided the shuttles and biked the 4.5 miles to the rental car place to pick up my car. The bike worked great, and I felt great, but it was pouring down rain. So dripping wet I waited in line, got the car, put my bike in the trunk, and headed back to the hotel. Everything is drying out now — just in time to get soaked again tonight during the race! Later that day... The sun came out at the end of the day, dried up all the streets, and we raced on the perfectly dry (and fast) streets of downtown West Chester. It was a hard race, and I ended up 38th. This entry was posted in Racing and tagged criterium, Racing, usacrits on July 15, 2010 by kartoone. Our Pro/1/2 race was also really big (maybe 70 guys) and stacked with local pros and really fast amateurs. We lined up with six guys – me, Lennie, Darryl, Wes, Mike, and Terry. It was super fast from the start. I had a good start, fought stay up front, and went with small moves on the 2nd, 3rd, and 4th laps. Then on the 7th lap, I made it into a strong looking move with about 10 riders. We had a good gap pretty quickly maybe 10 seconds after being away 1 lap. We were working pretty well together although with 10 riders there were a couple sitting on and not taking their turn at the front. A couple laps later, Terry came across to our break with a couple other guys. Even more people started sitting on and others started attacking. At that point, the break was doomed even with good team representation from all the teams. Sure enough a couple laps later we were caught. Our break lasted about 10 laps (see my heartrate data below). When we came back to the field, I was discouraged and pretty tired. I felt like the field wasn’t going to let anything get away so I drifted way back in the group trying to recover. After spending a few laps there, I worked my way back up to the front to start covering moves again. Before I made it though, a good move got away with maybe 7 or 8 guys. They got a great gap on the field and started pulling away. But our pace was relentless and we were closing, closing, closing. I fought hard for position and with one lap to go was third person across the line in the front of the field. I knew the surges would start so I attacked to stay at the front and then fought hard for position on the downhill backside of the course. I came out of the last corner sitting about 7th or 8th wheel, passed a couple guys and didn’t get passed by anybody – but it was only good enough for 16th. Darryl finished right behind me in 17th with Terry and Mike just behind them in the top 25. We woke up to cold and rainy skies. When we arrived at the start right outside City Hall in the quaint old town part of Union City, it was still cold and rainy. I warmed up 5 minutes under a big awning before heading to the start line. After a couple last minute instructions (while it was still lightly raining), we were off. And man were we off – attacks from the word “go”. We made it out of the town and onto the main road and I got into an early move that lasted about 200 meters. The pack was flying though so we were reeled in and more attack / counter attacks went. I was in some of them and Terry was in some of them. Eventually we made it onto the lap part of the course and coming down a hill pretty fast into a long gradual uphill, I knew something was about to go because everybody was tired and I could see a move on that hill getting away. Sure enough – a couple guys attacked the bottom of the hill and as I was desperately trying to get clear on the left to go with it, I got stuck behind the guys coming off a previous move. Fortunately though, Terry saw the same events unfolding and nailed it up the righthand side latching onto the break and they were gone!!! It was a great break with good team representation so at that point all me and my teammates had to do was watch the front and cover any moves that materialized. Mike Lackey and I took turns covering lots of moves. Eventually, a strong rider (I think maybe John Stowe?) rode off the front solo. He looked really strong, and the field didn’t respond at all. In fact, the pace was really slow so I thought hey let’s see if I can get up to him without bringing the field with me. I attacked hard and sure enough, only one rider came with me – Jan Kolar (Birmingham Bicycle Company). This was perfect because the field let the three of us go. Jan and I worked hard to bridge up to John who was still ahead of us. Then once we came together we started putting time into the field and chopping into the break’s lead of just over 1 minute 15 seconds. Eventually we made it to about 45 seconds in front of the field and 35 seconds to the lead group. We were bombing down a hill when we came to an intersection and a police officer directed us the wrong way! None of us thought we were supposed to turn, but we knew the break had just come through so how could he direct us the wrong way??? Well, fortunately I had pre-programmed the course into my Garmin and so I convinced the other guys to turn around when the distance to the next turn began to increase instead of decrease. So we turned around just in time to see the field go flying straight across the intersection which we had turned at. We chased hard and eventually caught on to the back of the field. I was pretty cooked at this point so I was thankful to have a little while to rest at the back of the large field with a nice draft to pull me along. I knew, however, that a move could go at any moment so after a couple miles rest, I started to work my way all the way through the field to the front again. This in itself probably took about 5 miles so I was lucky that nothing got away during that time. Right as I made it to the front, AJ Meyer put in a hard attack which I went with. It was a strong attack but lots of people were watching him. By the time he motioned for me to come around, the field was already on us. AJ was relentless though and attacked several more times eventually getting the right composition of riders to satisfy the field. I made it into the break, too, and we were off. With several strong engines in our chase, we extended our lead pretty quickly. We had maybe 10 guys though so there were a couple guys sitting on. This disrupted our rhythm a bit as people didn’t want to put in maximum effort given that a few riders were getting a free ride. Even with the somewhat irregular rotation, we were putting time into the field and quickly closing in on the break who were having their own share of problems. My teammate Terry who was in the break told me after the race what was going on. He said that there were only about 5 guys pulling in the group of 9 riders. The others were just sitting on. This happened when the moto-official told them their gap had grown to 2 minutes, 15 seconds. So apparently a number of the guys either thought that the break was going to stick no matter what, or they wanted to save up energy for the finish. Well, the in-fighting that started because of the people not pulling allowed our group to catch up to them with about 20 miles left to go in the race. Let me interject a little op-ed piece, though, I was totally impressed with the Mountain Khakis team this weekend. Even though they didn’t like their odds in the break with Emile Abraham (Aerocat) being such a strong sprinter and their main sprinter back in our chase group — they still continued to roll through to keep the rotation going. That is perfect strategy because they were still saving up energy to work something out for the finish, and they were also giving their sprinter a chance to make it up to the group. Then in the end, Oscar gave the perfect leadout for Thomas and won the race! Ok, back to the report – I knew that once our chase group merged with the break that the resulting merged group was way too big for a happy harmonious rotation until 1k to go. Sure enough, even as we were rolling onto the back of the group, the attacks began immediately. It was pretty relentless too for a few miles which kept our pace overall pretty high and gave us enough of a gap on the field to stay away to the finish. There was a lull for a little bit when a small group motored by Frank Travieso (Jamis/Sutter Home) bridged up to us. My teammate, Darryl Seelhorst, saw the move and rode across with it to give us 3 guys in the group of about 25 to battle it out for the last 15 miles. Those last 15 miles were hard with attack after attack and a few steep rollers that shattered our group. The headwind was pretty strong though and people were tired so each move kept coming back to the group and riders who had been dropped kept bridging back up to the group. Terry and I took turns covering moves while Darryl recovered from the bridge he had made from the field to our group. When we made the turn back onto the main highway back into Union City, the headwind was just horrific. Still, even after all the attacks on the rollers, people launched attack after attack. I covered a couple moves and then even launched once of my own. I think we were all just going crazy. Everything was coming back though so as we approached the lefthand turn off the highway into the streets to make a series of 90 degree turns to the finish, I knew that you had to be way towards the front if you wanted a chance to sprint so I fought hard to stay at the front and managed to be about the 5th rider back with 1k to go. At that point Oscar Clark (Mountain Khakis) got to the front and ramped the pace way up to lead it out for his teammate Thomas Brown. We were single file behind Oscar through all the turns until he pulled off next to the railroad tracks with about 300 meters to go. I was still sitting in 5th position when I heard a horrific crash just behind me – that terrible sound of metal/bikes/bodies hitting the deck hard. It was 300 meters to go though so everybody in front of it started to sprint. Emile Abraham (Aerocat) came around me right away and I latched onto his wheel. I got a little confused and thought for a second that our turn was a parking lot right before the actual turn so I left off the gas just a tiny bit enough to lose Emile’s wheel. Coming out of the corner though I still had a lot of speed and felt surprisingly good (I think we had a hard tailwind as soon as made that final turn) and hit it as hard as I could passing a couple people to finish what I thought was 4th but later ruled 5th. Darryl and Terry were caught immediately behind the crash. Thankfully, Darryl dove to the left and Terry dove to the right bouncing off of people and bikes and managed to stay upright and both place in the top 15!!! (12th and 14th). Mike and Wes hung on in the field which had really closed the gap to us so they must have been riding hard. Mike finished high up in the field sprint even after covering a lot of moves throughout the race and Wes hung on and kept it upright. Great racing guys!!! Here’s a picture of my teammate Philip and his wife Catherine at the start of the TT yesterday morning — which they won! Great job Team Thompson! 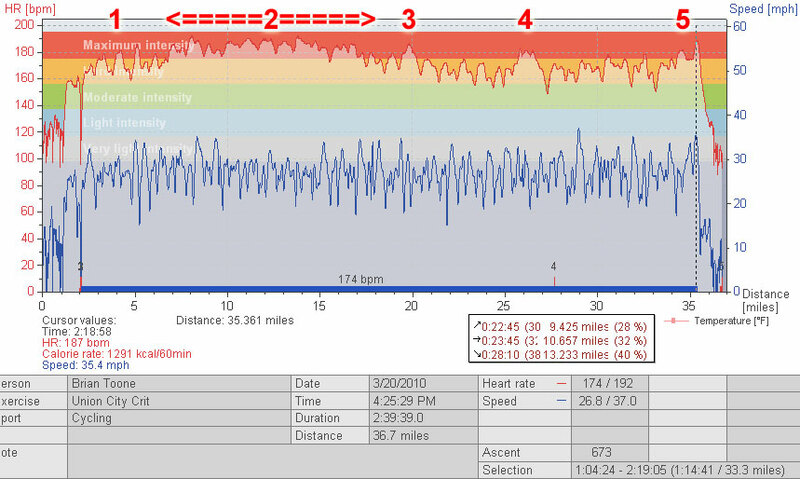 This entry was posted in Racing and tagged criterium, heartrate, Racing, road race on March 21, 2010 by kartoone.